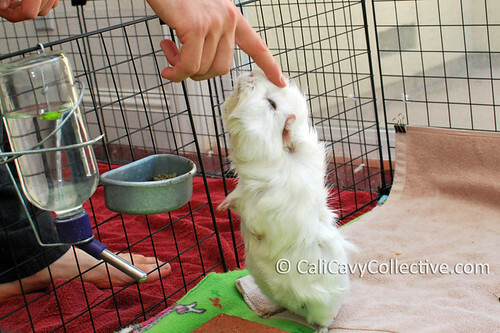 Little Abby-Roo was begging for a treat during cage changing, but received nose scritches instead. Her woeful expression was difficult to resist, though despite her best efforts, she wasn't immediately given a snack. 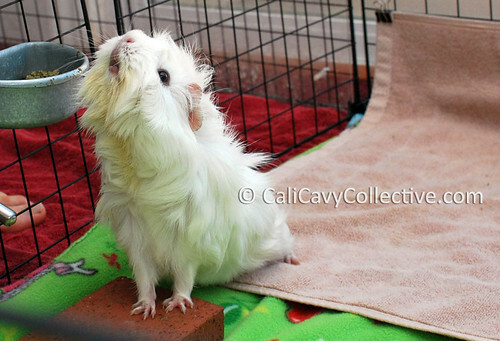 However, all of us pigs did get cucumber after the cage was cleaned. We ended up waiting over half an hour, but better late than never. It's so tough when all that adorableness doesn't pay off! Poor Abby-Roo, you do your best posing and the stoopid humans fail to reward all your hard work. Happens all the time. Sometimes they call me over just to pet me! The outrage. Clearly the human slaves are not showing you proper respect. I recommend a strategic peeing, sisty recommends killing them but she is a little bit impulsive like that. Cagemates say its a no go on Boomer's suggestion, lest no one come to feed us. Will keep strategic peeing in mind.